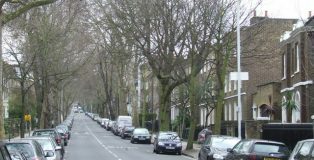 Camberwell Grove closure: but what about…? 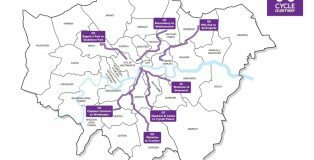 Members of Southwark Cyclists had a meeting last week (May 3rd) about the Southwark Spine route with project manager Albert Ang and design manager Hugh McCarthy. To get from Burgess Park at the south to New Kent Road at the north, the Quietway 7 goes up Portland Street (the lesser, not the Great), over East Street, and up Brandon Street. 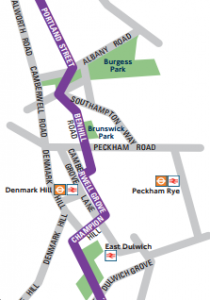 Part 2 of the Quietway 7 update is rather longer, and about the current situation on Camberwell Grove and Champion Hill. 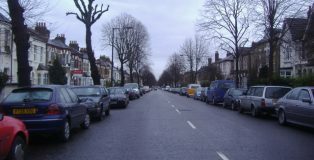 Quietway 7 runs from Elephant and Castle south through Burgess Park, Camberwell and Dulwich to Crystal Palace.